The Gallery is open from 7 am daily. Light Breakfast is served from 07:00-10:30 each day. Our all day dining menu is available from 12:00-22:00, while our famous Afternoon Tea is served from 13:00-17:00 every day. The Gallery, which is famed for its exquisite Westbury Afternoon Tea. Here, you will encounter first-hand the hotel’s famously warm and intuitive service. Please call directly on 01-6463352 for reservations of 7 people or more. We requested a window seat and on arrival there were two but we were seated at another table very close to another couple having lunch. Then there was extremely poor service we were forgotten about after we were seated and did not get food for 50 minutes even though we only get the table for 2 hours. A number of tables came in after us and were served. Unfortunately our experience for Afternoon tea was not the best due to this and we found it unsatisfactory given the price. 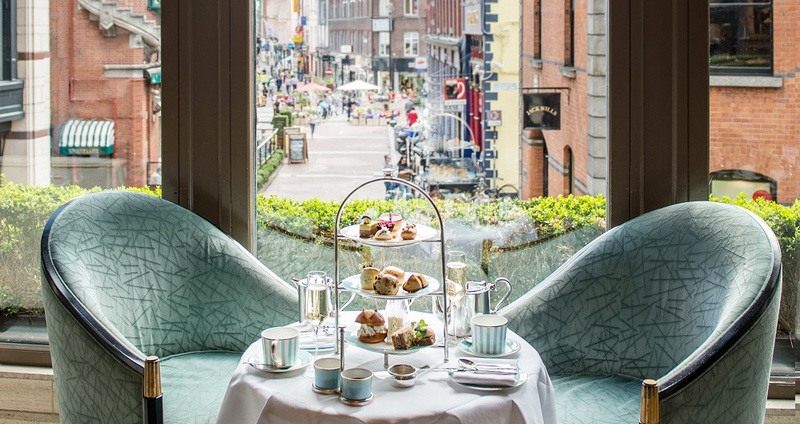 Afternoon tea at the Westbury is one of the nicest ways to spend a weekend afternoon in Dublin! 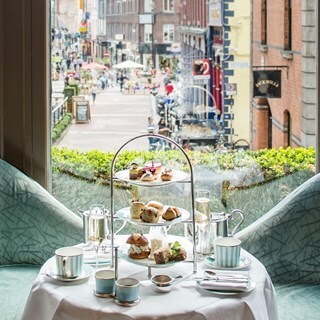 We were sat at one of the tables at the window which has a great view down towards Grafton Street and enjoyed looking out while sipping our tea. The staff were also all so friendly, striking the right balance between attentive yet relaxed so it never felt like we were being rushed. Just wonderful! We had champagne afternoon tea at the Gallery and loved it! Inventive sweets and attentive service. Highly recommended! Very enjoyable Afternoon Tea, a lovely treat! The cost of the High Tea just seemed excessive for the volume of food that we received. The sandwiches were delicious. The financier was bland. The yogurt dessert was not good. The scones were fabulous, the sandwiches were a little on the hard side. Dessert was very disappointing but we did get a fabulous special slice of cake for a special birthday and we were delighted with it. The tea was just heaven we felt very relaxed we could have stayed all afternoon. Best Afternoon Tea ever! Everything was faultless from ambience to  food to  teas but what really made it such a lovely treat was the friendliness of the staff. The ladies couldn't have been nicer or more helpful - I'm only sorry I didnt pay more attention to their name tags so that I could name them individually! Food and atmosphere was lovely. Service was poor had to keep looking around for service and were only asked once if we were alright. As always extremely pleasant staff, really good customer service with attention to detail. Food was amazing and we wanted for nothing, thank you for a lovely memorable experience. Great service and Food. Highly recommend. Geovanie our waiter was fantastic he really made our afternoon. Thanks again. Afternoon champagne tea for my mum's birthday was a really really fantastic experience. We felt really spoiled and were very very well looked after! I had a very small baby with me as well and the Westbury couldn't have been more accommodating. They gave us a lovely big table by the fire out of the direct thoroughfare (as I wanted) but still with a great view! We tried lots of the teas and the staff were so patient and helpful. A super super day! I have had high teas elsewhere in Dublin, but this experience st the Westbury was by far the best, for food, drink, setting, atmosphere and staff. Thanks to you all!! Highly highly recommended! Fantastic 5 star Dublin city center Hotel with very pleasant and helpful staff. We will definitely be returning. Service was perfect , sitting area lovely . We were disappointed with food , pastries looked pretty but not great taste , scones were hard to butter as they crumbled , that said the vegetarian sandwiches were v good . We had the most amazing afternoon tea and the vegetarian option, which I chose was outstanding in terms of taste, presentation, and variety. Fantastic afternoon - would recommend to anyone. Excellent service too. Fantastic service and wonderful atmosphere! As always the best afternoon Tea in Dublin. Lovely atmosphere, excellent service and food amazing. Staff took time to really explain everything that was on our stand and recommend different beverages to us. Looking forward to our next time at the gallery. My family and I enjoyed afternoon tea service at The Gallery. We were impressed with the selection of food and teas/coffees offered. The staff was incredibly professional and attentive to our every need. I was particularly impressed with how the staff handled gluten and dairy dietary restrictions. Amazingly, I was able to indulge in a variety of wonderful food and teas, and never felt as though I was missing out on delicacies that everyone else was enjoying. It was actually quite nice to have my own selection of food to choose from. Also, the atmosphere was just right, catering to families, friends, and couples. Everything was wonderful, the only complaint we had was the table wasn’t cleared, to many dish/ cups. We stopped in for afternoon tea and were seated in a cozy corner near the window. What a beautiful way to spend the afternoon. The tea selection was lovely and the sandwiches, scones and desserts were scrumptious. Thank you for a wonderful experience!